All About Pump Repairs Pty. 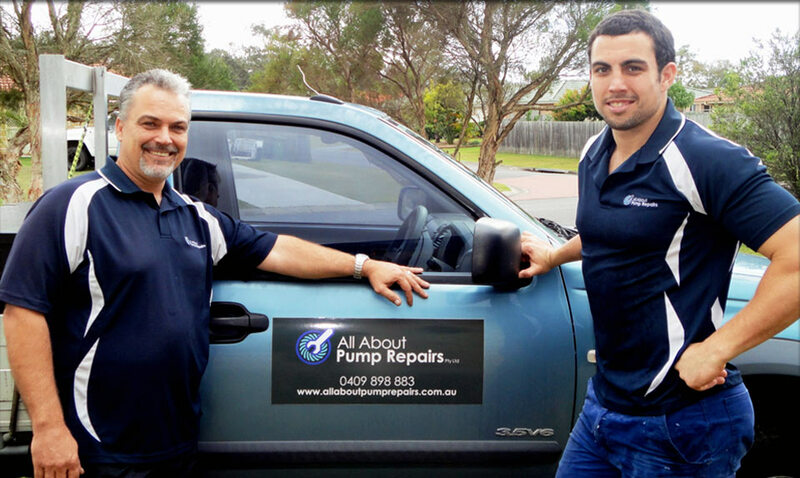 Ltd. established in 2010 is a locally owned and family operated Pump Company in Brisbane Qld. Our business offers complete and diverse services for all domestic, business and rural applications with various pump types and requirements. We have your pump problems completely covered, from pump repairs, pump sales, pump accessories and spare pump parts. We pride ourselves in providing our clients an efficient, prompt and affordable service. Our experience is extensive and achieved by our teams regular participation in Accredited Pump Courses and continual Product knowledge through frequent interaction with our respected suppliers. Our friendly service technicians Rick and Brett work hand in hand with clients in the pursuit of identifying the cause of failure to pumps, eliminating future problems and focusing on increasing the life of the pump. I thoroughly enjoy working in the Irrigation & Pump Industry and have done so for the past 17 years. In 2010, my son Brett & I opened our own family business as we saw the need for prompt service & repairs, expert advice, quality and affordability. During my working years I have attended extensive Pump & Irrigation Courses and I keep up to date with the latest product and industry information or trends through frequently interacting with very knowledgeable and respected Suppliers in the Industry. In saying that, I am very confident that I can help with any Irrigation, Pump, Tank or Filtration need. After leaving school, I enjoyed following in my father’s footsteps by entering the Irrigation & Pump Industry. and experience to our customers by providing open and honest advice that you can trust with complete confidence. I am keen to provide prompt, professional and affordable services to our valued customers. Our Motto: All About Customer Service, All About Affordability, All About You.